Eyebrow transplantation involves extracting hair from the scalp or elsewhere on the body then implanting it in the eyebrow to replace lost hair. This is simply the best way you can choose to restore thinning or lost eyebrow hair. Eyebrow transplantation is the solution for any kind of eyebrow hair loss no matter the cause. It's even possible to restore hair growth on scarred eyebrows. Moreover, this procedure is a long-term treatment option that actively solves the problem without resorting to stop-gap measures like use of make-up or constant application of medication. The hair implanted grows normally and will regrow just like native eyebrow hair if shed off. It is also a simple, minimally-invasive procedure that surgeons can perform on an outpatient basis. There's no significant pain or discomfort and the recovery period is very quick. 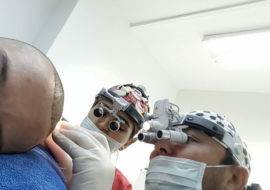 In an eyebrow transplant, the surgeon usually extracts the donor hair from the back of the scalp just like in a normal hair transplant procedure. The donor hair may also come from the other eyebrow if it's partial eyebrow hair loss involving only one eyebrow. Additionally, if it isn't possible to acquire donor hair from the head, the surgeon can use donor hair from other parts of the skin depending on the thickness of the eyebrow hair. The extraction of the hair from the back of the head is through Follicular Unit Extraction (FUE). In FUT or strip method, the surgeon cuts a strip of skin containing hair follicles from the donor site after which it is dissected microscopically to extract individual follicular units for transplantation. The surgeon then closes up the donor site using sutures. FUE Eyebrow Transplant involves partial shaving the donor site then harvesting of individual follicular units directly from the scalp. 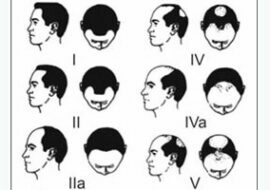 The technique used to harvest the follicular units will depend on a number of factors such as your willingness to have short hair, the density of hair growth on your head, financial constraints, number of grafts required and other concerns. Hair grows on the eyebrows in a different way compared to the one found in hair on the scalp. Hair in the scalp grows in follicular units which contain 1-4 hair strands. On the other hand, eyebrows have hair that grows solely as individual hair strands. The harvested follicular units from the donor site therefore have to be prepared before being implanted into the eyebrows. A specialised team divides the follicular units into single hair grafts using a high-powered microscope. The number of grafts prepared depends on the degree of eyebrow hair loss and natural hair density. For restoration of partial eyebrow hair loss that may be due to a scar, as little as 50-100 hair grafts are needed. However, the restoration of a full eyebrow may require as much as 400-600 hair grafts to ensure an acceptable outcome. The surgeon then implants each of these hair grafts into the predetermined recipient sites. These recipient sites should be marked in accordance with the aesthetic described by the patient and also guarantee a natural-looking result. These grafts are inserted one by one into each recipient site. By then, the patient is usually sedated and the surgeon applies a local anesthetic to the recipient area to make this procedure painless. The surgeons implanting the hair grafts have to account for the angle and direction of growth. Compared to the hair on the scalp, eyebrow hair tends to grow at a more acute angle compared to the skin surface. The surgeon therefore requires a lot of skill and expertise to ensure the implanted hair looks natural. Moreover, the surgeon has to implant hair grafts that follow the natural curve of the eyebrows. To imitate the appearance of a natural eyebrow, the surgeon must also try to arrange the implanted eyebrow hair grafts in a way that will allow them to grow in a criss-cross manner. This is particularly true for the medial and central portions of the eyebrows. Judging from all these considerations, it's imperative that you only submit to this procedure once you are completely certain that the surgeon's skill and experience can't be called into question. Keep in mind that poorly done eyebrow transplants can be totally ineffective and a complete waste of your money. Due to the fact that the individual hair grafts are carefully placed into each recipient site, the procedure can last for a long time. The time has taken mostly depends on the number of hair grafts being transplanted but the expertise and number of surgeons can also play a huge role. Eyebrow transplants to remedy partial eyebrow hair loss may require up to 3 hours to complete. For an elaborate procedure like a full eyebrow restoration, then the procedure may last for around 6 hours or more. Eyebrow transplantation is minimally invasive and therefore has a quick recovery period. If the donor hair extraction was done through FUE, you can resume normal activities in as little as 48 hours. However, you're better off waiting for a week for the obvious signs of the procedure to fade. After about 3 weeks, the transplanted hair on the eyebrows will start falling off. They will then start regrowing after 4 months. At 6 months, your eyebrow hair will start getting noticeably dense. That's because the transplanted eyebrows will continue to grow to the size of scalp hair. You may need to trim your eyebrows regularly every 2 weeks to maintain your eyebrows. 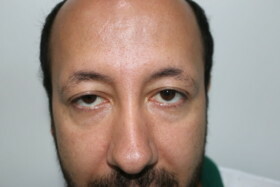 The final results of the eyebrow transplant will be evident after 9-10 months. You can then know just how successful the hair transplant was. Eyebrow transplants have minimal risks. Bleeding, scarring and infection are very rare. With the use of FUE, there's practically no scarring to speak of. Infection is easily prevented by administration of antibiotics after the procedure. Suboptimal results constitute most of the risk associated with eyebrow transplantation. A poor angle of implantation by the surgeon will cause the eyebrow hair to grow in wrong directions and cause an unnatural appearance. 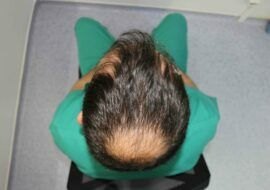 The hair grafts could also be damaged during the procedure or fall off due to poor implantation at the recipient site. There may also be some ingrown hairs or mismatch of hair color and texture. Such risks may ruin the outcome of a procedure and necessitate corrective measures that could cost more money. A sure-fire way of avoiding such outcomes is by selecting a qualified surgeon to perform the eyebrow transplant. 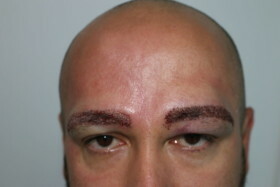 The time and level of expertise required to perform a successful eyebrow transplant mean that it can be very expensive. This remains true even though the number of hair grafts used is small compared to normal hair transplants. 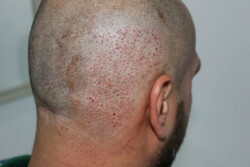 The number of hair grafts transplanted during the course of the procedure is typically the main determinant of the cost. The cost of the procedure may range from €2,000 to €6,000 depending on the region. Eyebrows are one of the more important factors that determine how you look. However, we often underappreciate just how eyebrows define our looks and help express our facial expressions. Only when we lose our eyebrows is their significance really portrayed. A person without eyebrows definitely attracts more attention and startled looks than a person who lacks hair on the head. While the use of make-up and other similar cosmetic treatments is useful in the short-term, they don't actually address the root of the problem. On the other hand, eyebrow transplants are a permanent solution that works to reconstruct your eyebrows. It therefore makes sense that eyebrow transplant is becoming a more and more popular treatment option. The most common cause of eyebrow loss is over-plucking. It happens when you take grooming of your eyebrows to a whole other level. Shaping your eyebrows through plucking is a relatively safe and common way to keep your eyebrows symmetrical. It's a favored method since the results last longer than shaving. Unfortunately, repeated plucking of the same areas of hair within the eyebrows leads to weakening and damage of the hair follicles. This can lead to permanent loss of hair. Plucking your eyebrow hair can also lead to infection as it leaves pores in the skin that are vulnerable to bacterial infection. An infection can subsequently cause further hair loss. Disinfection of your tweezers before is therefore imperative to reduce the risk of infection. Tweezing of eyebrow hair can also lead to problems if the hair breaks off beneath the skin as you pull it out. In such cases, the skin may grow over the pore and prevent visible hair growth. The hair will instead grow beneath the skin forming ingrown hairs. Before you undertake this kind of cosmetic eyebrow-shaping, you should be very careful. It takes up to 6 weeks to regrow one eyebrow hair if it's plucked. Any mistake you make during tweezing is one you will have to live with for a long time. Many cancer chemotherapy drugs cause loss of hair. This hair loss involves the body hair, scalp hair, eyebrows, and eyelashes. The hair loss occurs a few weeks after the start of chemotherapy. Fortunately, the hair loss is temporary and hair growth will resume weeks to months after stopping the treatment. Injuries occurring on the face are another common cause of eyebrow loss. Burns, chemical trauma or physical injuries can lead to formation of scars over the eyebrow. These scars will prevent any hair from growing leading to loss of eyebrow hair. Biotin is arguably the most important vitamin involved in hair growth. It strengthens hair, conditions it and prevents hair loss. Other B-complex vitamins like vitamin B6 and B12 promote blood circulation and formation of red blood cells hence promoting hair growth. Sources of B-complex vitamins include green vegetables, whole grain cereals and meat. Iron – This mineral is instrumental in the transport of oxygen in the blood. Oxygen, in turn, plays a part in many metabolic processes in our body including the growth of hair. Iron, therefore, plays a major role in the maintenance of hair growth. Examples of food sources of iron are spinach, liver and red meat. Zinc plays a major role in essential processes like cell division, regulation of hormone levels, absorption of other minerals and protein synthesis. Virtually all these processes occur during in hair growth hence hair loss is usually a common symptom of zinc deficiency. You can find zinc in poultry, red meat, liver and eggs. Omega-3 fatty acids these are useful in hydrating hair which helps to keep hair healthy and prevent damage. You can find omega-3 in fatty fish like salmon. This is a temporary form of hair loss that occurs due to a disruption in the normal hair growth cycle. A stressful physical or emotional event that puts the body out of balance is what typically triggers this condition. Certain medications or health conditions can also cause telogen effluvium. The hair loss occurs relatively quickly and can involve the eyebrows in serious or chronic cases. Once the stressful stimulus ceases, hair growth resumes normally after some months. A deficiency of thyroid hormone may also be a cause of loss of eyebrow hair. The thyroid gland controls the metabolic rate, use of energy sources and protein synthesis in the body. Insufficiency of this gland results in a multitude of symptoms that include chronic fatigue, weight gain and loss of scalp hair as well as eyebrow hair. This is a chronic autoimmune condition whereby the immune system attacks the hair follicles causing hair loss accompanied by inflammation. It usually appears on the scalp at first but can affect any region with hair, including the eyebrows. Doctors usually use corticosteroids to treat alopecia areata.